Who doesn't love milk and cookies. Also cake pops, I know we all love them. 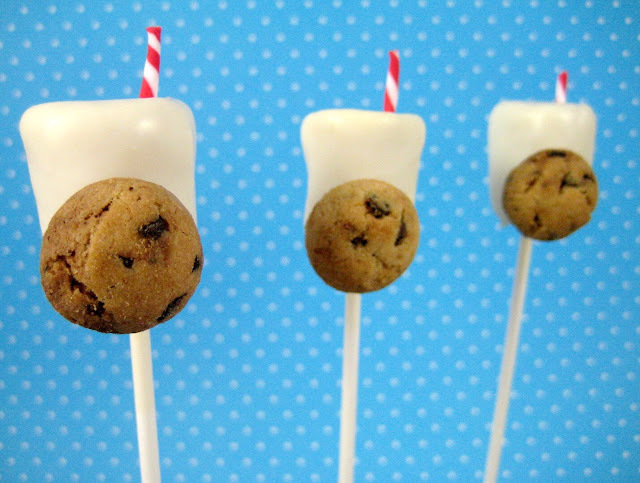 So really these milk and cookie cake pops were just destined to happen. 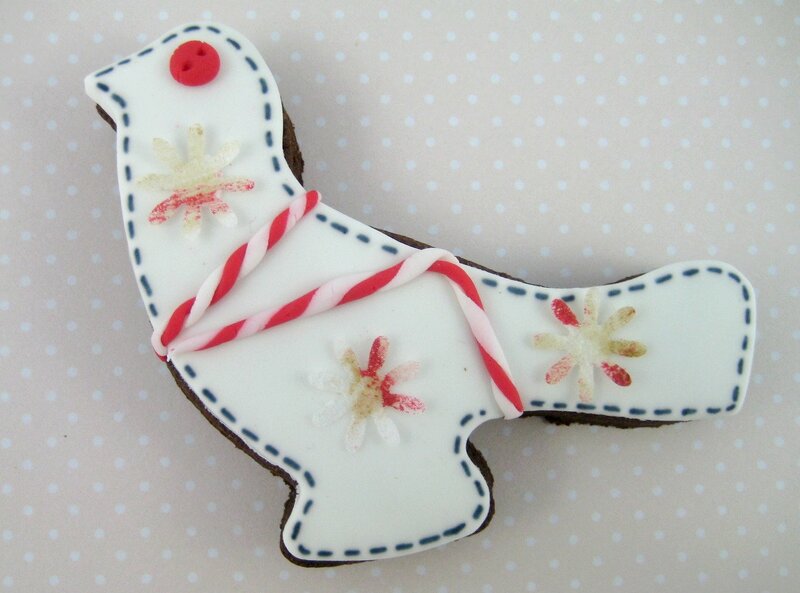 I came up with this idea ages ago while I was making some scrap inspired bird cookies.....see this pic here. I loved my little 'Scrappy Bird' but no one else was quite as taken with him. Anyhoo, while I was making Scrappy Birdy I trimmed off some fondant 'twine' and it looked like insy little striped paper straws. 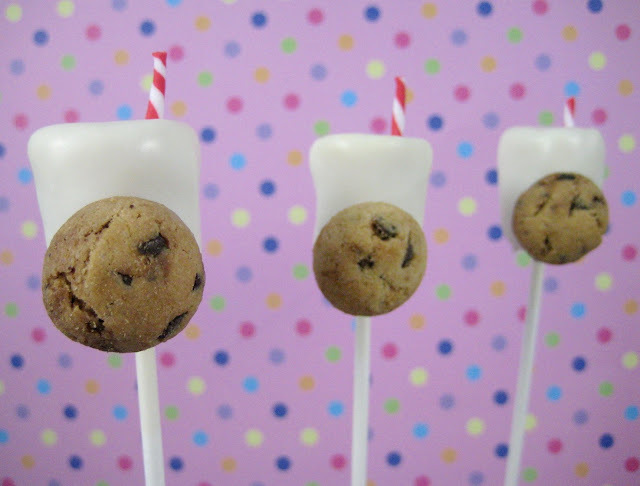 So I started wondered what I could do with a stack of teensy little fondant straws and then I thought of course..... milk and cookie cake pops. 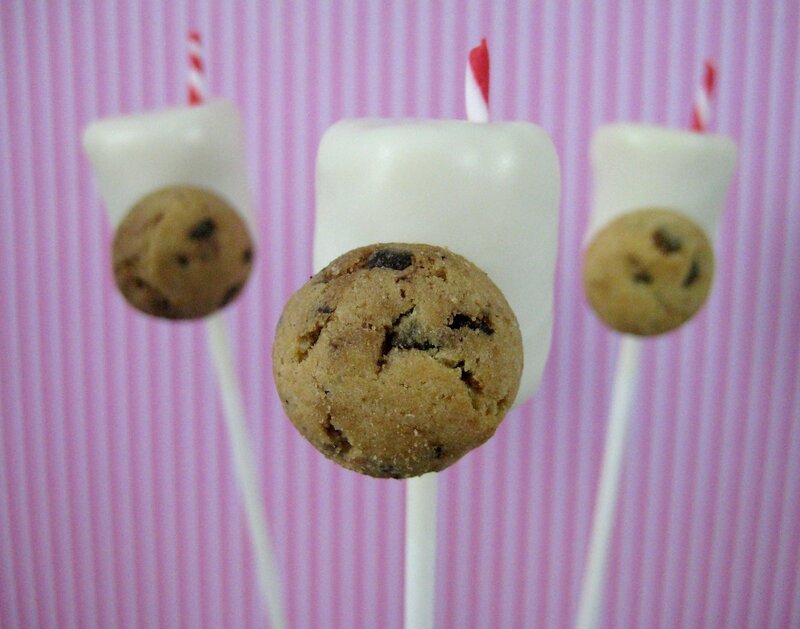 These pops are made from my white chocolate tim tam pop recipe, because that's what I had around, but afterwards I realised it was a great idea as now there are cookies inside AND outside of my milk and cookie cake pops. Dont'ya just love it when stuff like that works out without even really thinking about it. So these are pretty simple, be sure to make the straws a couple of days prior to assembling the pops so they have had a chance to set. white candy coating/melts (or white chocolate melts) I am going to call it candy coating for the rest of the tutorial. copha/or paramount crystals/or crisco for melting. Take some red and some white fondant and roll them (seperately) into a thin log using your fingertips and the workbench until they are quite thin. Twist the 2 them around each other like a rope and once again using your fingertips roll the combined, twined fondant back and forth gently on the workbench. Make sure to use really really gentle pressure or you might end up with the fondant twine being uneven. ( Although I guess it will not be such a big problem if your cutting it into small mini straw pieces). Once you have made the twine cut it into pieces about 1.5cm (1 1/2 inch) in length and leave on some parchment paper to set for a day or so. 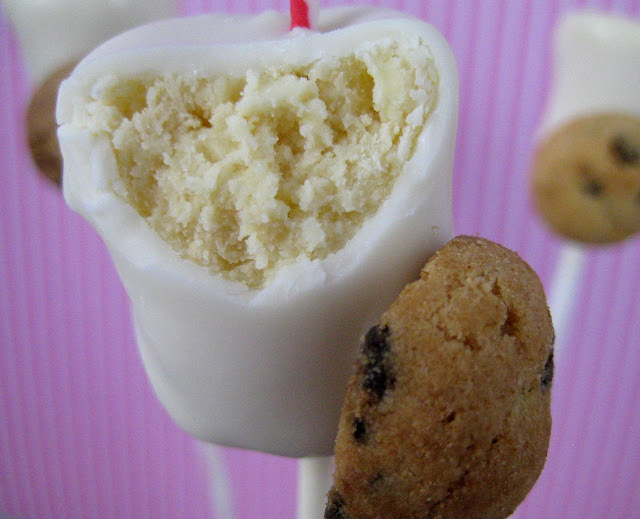 Make the cake or cookie truffle pops and shape into a milk glass shape by making a cyclinder that tapers up slightly. Chilli n the fridge until set. Melt the white candy coating in the microwave at bursts of 60 to 90 seconds at medium low. Do not overheat the chocolate. If you want your finished pop to have a really smooth finish you need to add some type of shortening to make the candy coating more fluid. I recommend copha if you are in Australia at a ratio of around 55g to every 400g candy coating, or paramount crystals in the US at a ratio of around 2oz to every 14oz candy bag. If you can not get paramount crystals in the US try crisco but it's not quite as good and you may need to work on the ratios. Once the candy coating is melted dip the end of a lollipop stick into it and insert into the bottom (thinner tapered end) of the milk shaped pop. Place onto parchment lined trays and chill for 10 minutes. Ensure candy coating is still fluid and if not remelt at medium low heat. Remove pops from fridge and holding the end of the lollipop stick completely submerge into the melted candy coating. Lift out and hold over the bowl gently tapping to remove excess candy coating. Take a bit of time with this step otherwise your finish may not be as smooth as you might like. 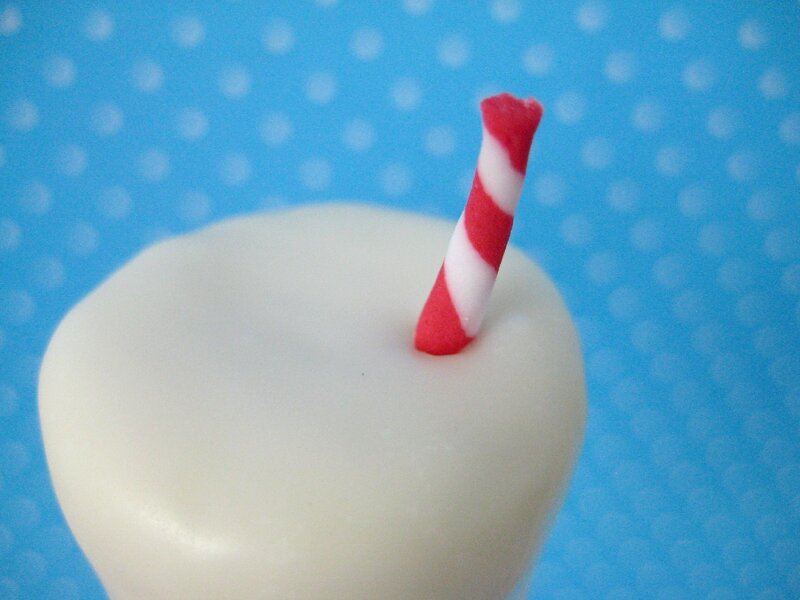 Place the pop upright into the styrofoam block and using a toothpick make a hole in the top of the milk glass pop and push the premade fondant straw in. 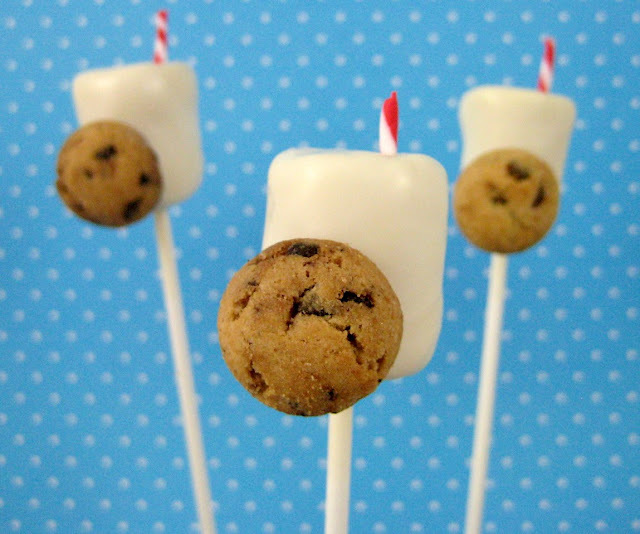 Take one of the mini cookies and hold it onto the front of the pop until it sets a little and is secure. 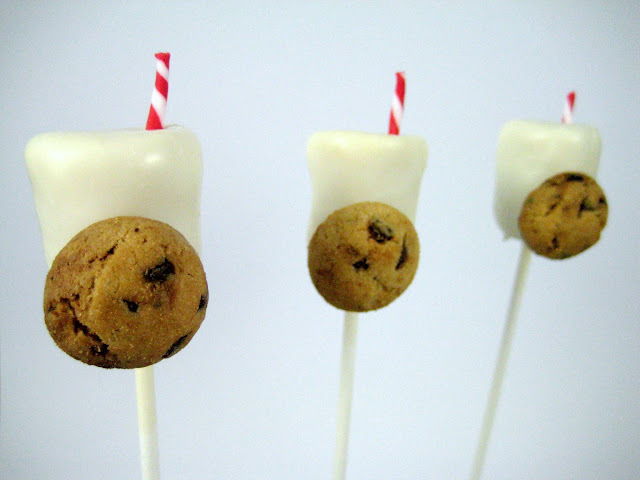 So there you have it, my quick how I made milk and cookie pops. Obviously you can make the straws any color you like and change up the cookies (I think mini oreos with blue and white straws would look great). Also I have been wondering if those jumbo candy cane sprinkles you can get at Christmas time might work as straws if you cut off the rounded end....but seeings as I don't have any and making the fondant straws is kinda easy I'm just gonna keep on wondering. Ok seriously, I can not stress how much i love these!! I will totally be making them and you will be seeing them on my blog, lol! Love this! Oh and I think your scrappy bird is adorable!! This is genius. Love them! And I also love your scrappy birds. They're so sweet. They are far too cute for words!! And white tim tams are my all time fave cookie (probably a good thing we can't get them over here lol). Really clever little cake pops, excellent job. Genius idea using the white timtams. Yum! Such a good pop idea, I love the tiny straws! Wow, these are amazing!!! I really want to make these :) thanks for your awesome recipes!